Miss Adamson and I had a lovely evening at the Whickham School Transition Awards on Tuesday evening when we accompanied the parents and winners of Fellside pupils from Years 5 and 6 who had been nominated for displaying the attributes of one of the Olympic Values. The nominees, who all received a lovely framed certificate, listened intently as Whickham School staff read the testimonials written by their teachers about how they displayed the tenets of one of the 7 values: determination, courage, excellence, equality, respect, friendship and inspiration. Speaking of inspiration, during the interludes between the presentation of awards, we enjoyed performances given by children from the cluster primary schools in Whickham. These ranged from a mini-performance of Hamlet, to a presentation on Uganda! 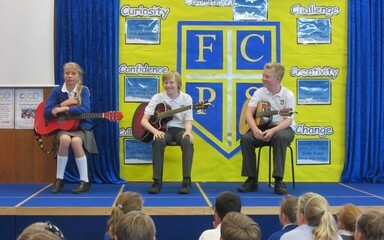 The guitarists from Year 6 represented Fellside, performing their version of ‘Radioactive’. Their performance was given rapturous applause –and quite rightly so. They were amazing! Many, many congratulations to all of the worthy winners from Fellside. You are a credit to our lovely school and to your families. So proud of Nathan. Such a shame we could not be at the Awards evening to receive the award. It sounds like it was a lovely evening. Well done to everyone who received an award.